You are here: Home / Ethnic Groups / The People of Sumatra / Who are the Penesak? The Penesak (or Meranjat) live in the province of South Sumatra. The Penesak people group is known by several other names including Meranjat, Tanjung Batu, and Kelekar. The Penesak dialect is part of the Musi language group which also includes the Musi, Pegagan and Belide. The Penesak prefer to live in ethnic enclaves when they move out of the Penesak area, for example, to the Betung area of Banyuasin Regency. The Penesak are known for their friendliness. This is demonstrated by their engaging style of speech. They openly address others, offer long explanations of all that they know on a topic, and seek to make others feel at home. The Penesak no longer have a traditional leader or chief. Their leaders are general community members. Penesak people who move outside the area often go to Java. Some move to Palembang to attend high school or college. On the other hand, most who move to Java go there for work, not education. Because land in the Penesak area is not very fertile, the people use slash-and-burn agriculture, moving after each season. The natural forests are becoming depleted due to the continuous search for fertile fields. Old fields are quickly overgrown by weeds and are difficult to use for farming. The Penesak have had some success in cultivating rubber, pineapple, sugar cane, and vegetables. 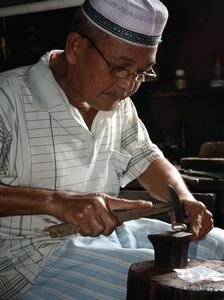 Traditional customs are influenced by Islam. These include wedding, birth, death, and circumcision ceremonies. One of the most strongly held customs is the wedding ceremony. When a marriage contract is made, the groom and his family visit the bride’s family. The couple then returns as part of a procession to the groom’s house to formalize the wedding plans. The engagement party is serenaded by tambourines and music. The groom wears a long white robe and a turban. The wedding ceremony is opened with long readings from the Quran. Formally, the Penesak people are Muslim, but they practice many animistic beliefs in their daily living. The Penesak watch over the graves of their ancestors and consider them to be sacred places. Every village has a sacred burial ground that is said to possess its own supernatural power. They believe that this spiritual power was possessed by the ancestors buried in that place and is still effective long after the ancestor has died. For example, if, while he was still alive a person was able to cause a plane to crash, an enemy plane that crosses over his grave will also crash. Every year, villagers visit and maintain the cemeteries in their villages as a required ritual. The most urgent need is help in applying appropriate agricultural technology to overcome the problem of low soil fertility in their area. The Penesak also need local development because they live in remote areas. Improved education and opportunities for work could help the Penesak become more self sufficient. Better training, medical staff, and equipment are needed to improve health care in their area.